Dads, Moms, Alumni and friends are invited to participate. Welcome to the 2019 Golf-a-thon page. If you are looking to pay for a pledge you may do so by using the donate button above. Golfers should arrive with pledges, golf gear and ready to have fun. 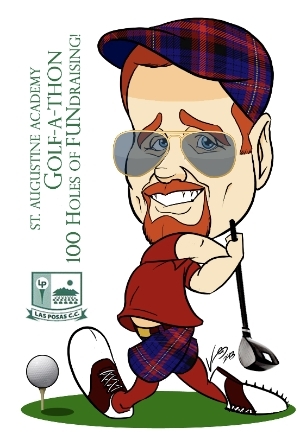 The money will go towards tuition assistance for the students at St Augustine Academy and will allow us to end the school year with a balanced budget or God willing with a small surplus to help with next year. Since the school does not have a Parish attached to it we must rely on generous contributions. Location will be at Las Posas Country Club in Camarillo, CA, Monday April 29. Check in will consist of handing in pledge sheets to receive keys to cart and rules. There will be a continental breakfast and a catered lunch for the golfers. We need to be done golfing no later than 4:30 p.m.
Take a maximum of six (6) strokes on any hole. After the sixth stroke, count the hole and move on. Play around slower groups, not through. Go to ANY open hole. Play two (2) balls on all par threes (3). Golfers may tee off on a hole simultaneously. Just don’t hit each other. If you hit someone apologize as you drive past. There is no need to stop if they remain standing. Pace yourself; you should play 10 – 14 holes per hour. If you throw your clubs when you get mad, throw them toward the green.